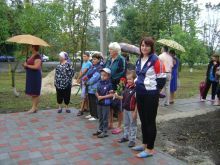 With a support of the joint EU/UNDP Project “Community Based Approach to Local Development” (CBA) rayon and local authorities and NGOs renovated care home for internally displaced people (IDPs) with special needs was officially opened in village Nova Galeshyna, Poltavska oblast on 31 July, 2015. 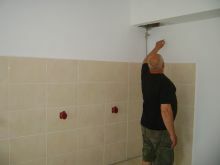 The first floor of the dormitory for the temporary living of IDPs was fully reconstructed, the roof and windows were replaced, the water supply and sewerage systems were installed, bathrooms were reconstructed, electric heating in the rooms on the first floor and boilers were installed; walls, ceiling and floor were refurbished, the rampant was installed at the entrance. After all works on improving living conditions on the first floor of the building were done, the dormitory in Nova Galeshyna became a shelter for 56 disabled people. The total cost of the microproject was more than UAH 1,5 mln., the EU / UNDP CBA Project provided more than UAH 1 mln. Also after the reconstruction of the 1st floor, the object received an additional EU financing with an amount of UAH 1 mln for the capital repair on the 2nd floor. “The aim of the EU/UNDP Project “Community Based Approach to Local Development” is to promote sustainable local development to improve living conditions of Ukrainian people. Taking into account the current situation in the country, we should jointly do everything we can to support people in need. That is why the support of internally displaced persons and reconstruction of the social infrastructure is one of our priorities today. Reconstruction of the dormitory in Nova Galeshyna demonstrated consolidated efforts of the Project, all level authorities and community”, highlighted Svitlana Slabinska, monitoring and communication specialist of the EU/UNDP Project CBA. “Due to the current situation people now especially require support. Oblast authorities will do everything they can to make life easier for those who really needs this today. From this perspective cooperation with the project gave us valuable experience: in co-financing for the implementation of such important local initiatives, and in joint project management”, underlined Petro Vorona, Head of Poltava oblast council. The Head of Poltava oblast council Petro Vorona, the Chief of Staff of Poltava oblast state administration Mykola Bilokin and monitoring and communication specialist of the EU/UNDP Project CBA Svitlana Slabinska officially cut the ribbon at the entrance to the dormitory. A symbolic key from all rooms of the refurbished building was given to Borys Lytvynenko, an IDP from Makiivka, Donetsk oblast. There Borys and his three sons found a temporary shelter in the dormitory in Nova Galeshyna after they have left their home in Makiivka. 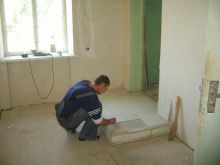 The man helped constructers to refurbish rooms. Borys brought with him a massage table and he hopes to come back to work soon. Besides renovation of the IDPs accommodation in Nova Galeshyna, the joint EU/UNDP CBA implemented one more microproject in Komsomolsk city, Poltavska oblast, with total sum of app. UAH 770 ths. Due to capital refurbishment of Komsomolsk Hotel “Slavutich” around one hundred IDPs got necessary conditions for living.